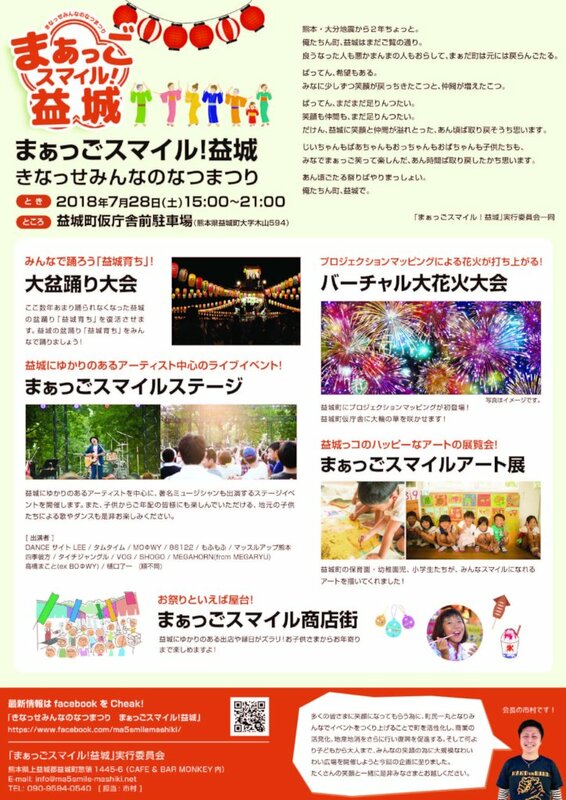 Waiwai Hiroba events in Mashiki-machi, Kumamoto Prefecture, is really growing popular. 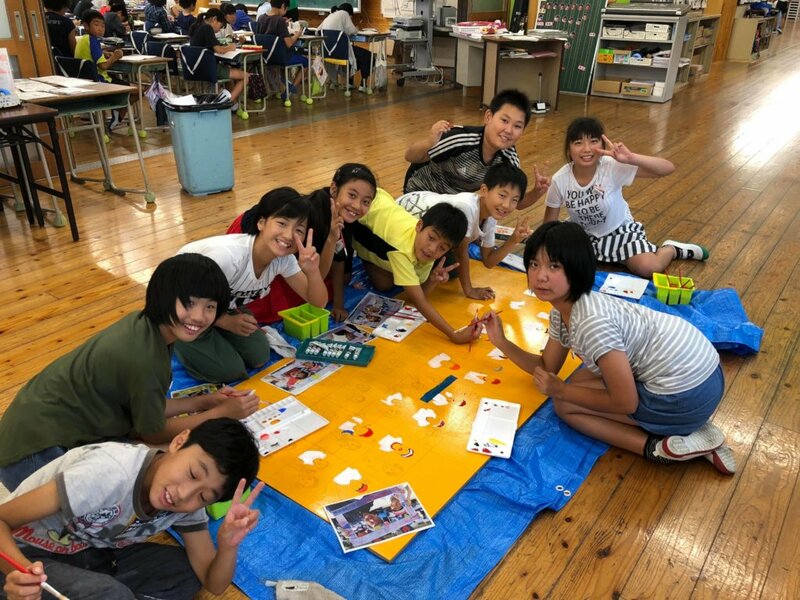 A large number of people come to attend events, and this is greatly owing to valuable supports from GlobalGiving (GG), which provided financial aid to them via DSIA in cooperation with Kamaishi Kitchen Car Team. DSIA started supporting a very tiny gathering of people, especially young entrepreneurs to hold an even in Dec. 17, 2017. They very much felt needs for building up Mashiki-machi Community, since many people were thinking of finding jobs in Kumamoto City and leaving the community. 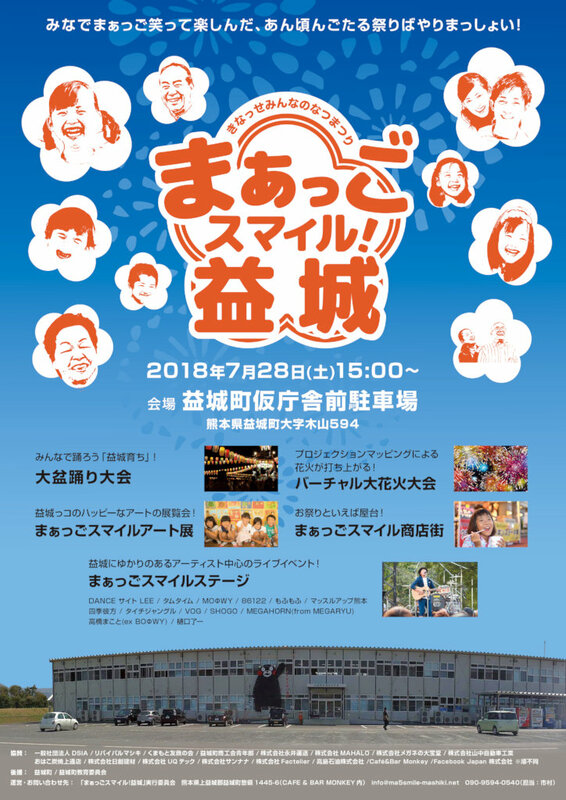 Young entrepreneurs have established small events four times with the funding of Kamaishi City and diverse other organizations, but when Revival Mashiki was established, GG came to support their Waiwai Hiroba (Chatting Place), successfully having about 200 participants. Then, it was considered a big success to initiate community building. A real big success came when Revival Mashiki organized the Summer Bon Festival not only to commemorate the completion of Yasunaga Shrine repairs, but also to restart the Summer Bon Festival which had not been organized even one year before the Kumamoto Earthquake. This means that the community relations among people had disintegrated even before the Earthquake. However, the Revival Mashiki succeeded to obtain collaboration from the Mashiki-machi government and mobilized NGOs, eleven companies, Mashiki Chamber of Commerce, and Mashiki Education Committee. 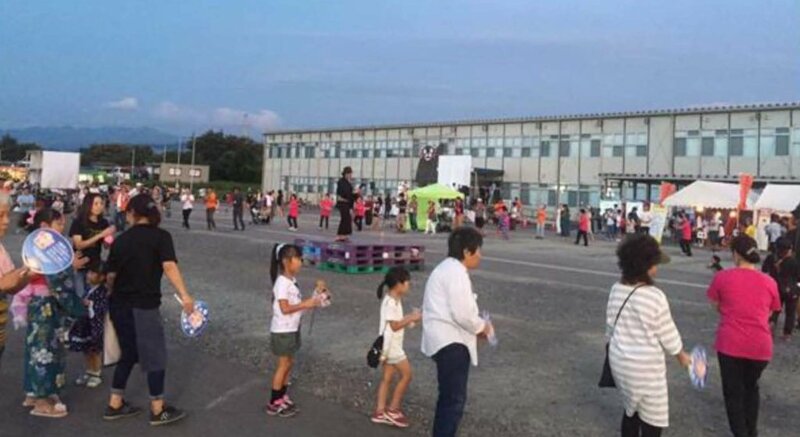 The Project Committee for the Summer Festival succeeded to mobilize the whole township. 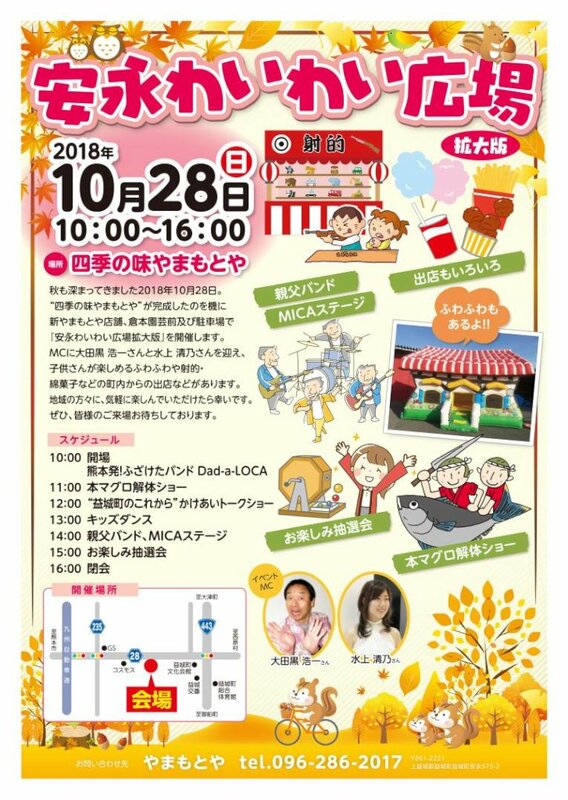 With such excellent community relations developed, Revival Mashiki organized another Waiwai Hiroba on September 9, 2018, for celebrating the Old People’s Day. They had as many as 390 people participating to events, radically increasing the interests of people in the local community in contrast to December 2017. Events organized were: free Japanese tea and cake for 400 people; free lesson on bottle flower arrangement; free performances by an ukulele artist; playing with a decorated horse, a historical ritual at the Fujisaki Shrine Festival performed for more than 1,000 years; ten food booths by local shops, whose sales were donated to the reconstruction of Yasunaga Shrine; and a donation box to contribute to the victims of Hokkaido Tanshin Earthquake. 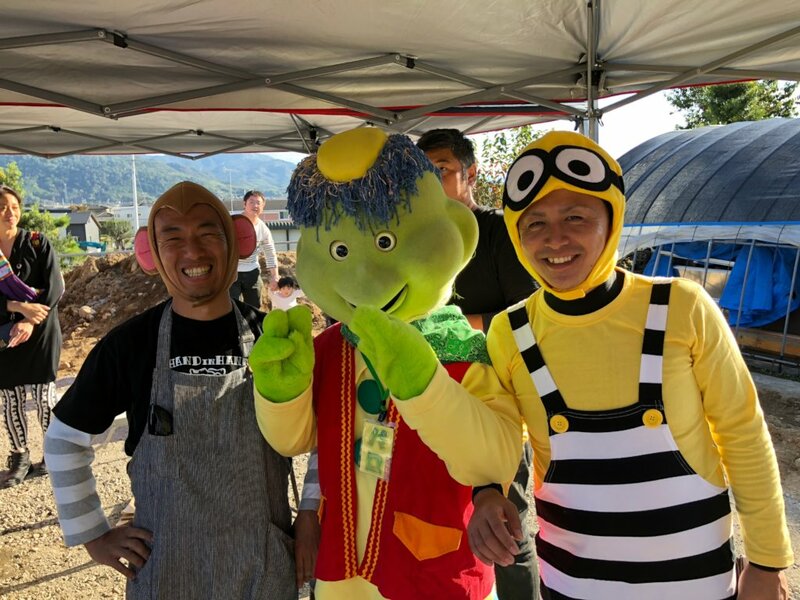 Another even was organized on October 28 as an extended version of Waiwai Hiroba, celebrating the new establishment of fashionable Restaurant Yamamotoya as well as offering the Halloween Party for children (Picture 1). Revival Mashiki announced to have children coming with Halloween costumes, who also performed on the stage (Picture 2). 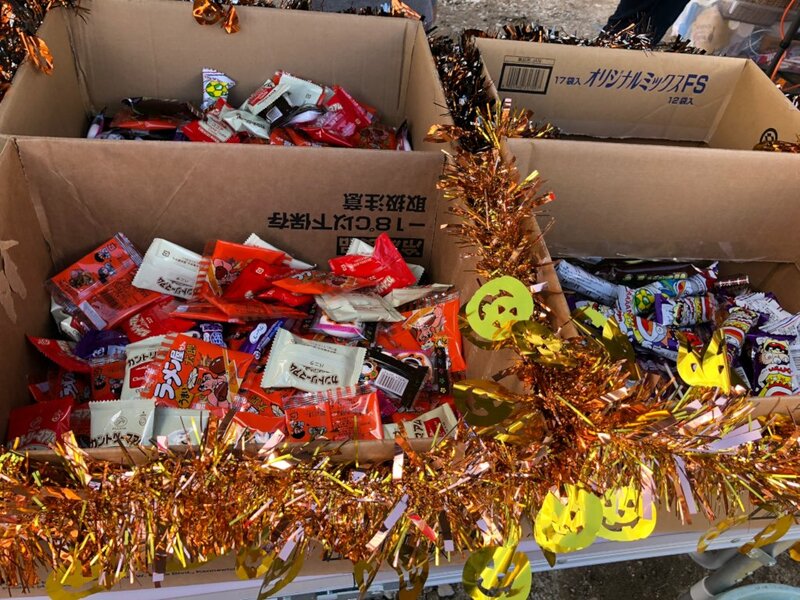 They also gave away Trick Or Treat presents to 400 children (Picture 3). A few adults wore animal costumes to entertain children (Picture 4). 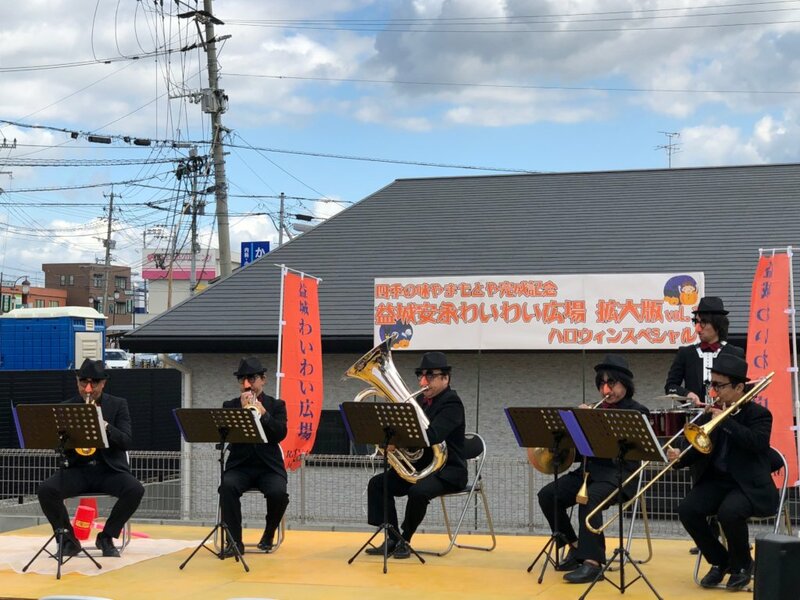 Besides, to make the occasion much more joyous, they also had the participation of comedians and comedy band, called Fuzaketa (Comical) Band, to fit to Halloween mood (Picture 5). They even had a cutting of a huge tuna fish inside Yamamotoya Restaurant, being sold 200 yen per pack, which is a delicacy in Japan. 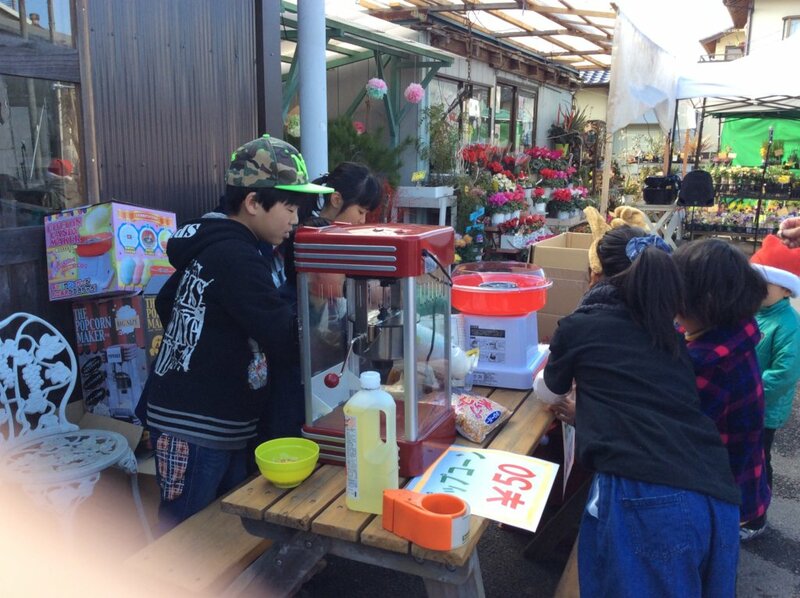 Six local shops also opened their food booth, and had a donation box to the Hokkaido Tanshin Earthquake as usual. Events offered were just unusual for this small suburban town, even for Kumamoto City. It was just like going to Disney Land in Tokyo. It was amazing that Revival Mashiki could mobilize the cooperation and participation of this many people to make the Mashiki Community lively. It attracted 455 participants, the highest number ever achieved other than the Summer Bon Festival. But children are the ones who really enjoyed the most, which warmed many people’s heart. GG’s support via DSIA was really fruitful and resulted in rebuilding the beginning of highly interactive, dynamic and warm community in Mashiki-machi, which becomes an indispensable source of energy for rebuilding the disaster-stricken area and economic activities. DSIA thinks that it had finished its role as a rebuilder of the community, and the Mashiki-machi is at the stage of standing on its own foot by themselves. They now have enough local participants and donors. DSIA hopes to come there several years later to see how this community movement blooms. DSIA expresses heartful and deep appreciation to those who have donated to this cause through GlobalGiving, needless to say about our deep appreciation to GlobalGiving itself. On July 28 (Sat. ), a summer festival “Mahgo (Happy) Smile! Mashiki” was held in Mashiki-machi, Kumamoto Prefecture, for redeveloping the area from the earthquake disaster. It started from 3 pm and lasted as late as 10 pm. 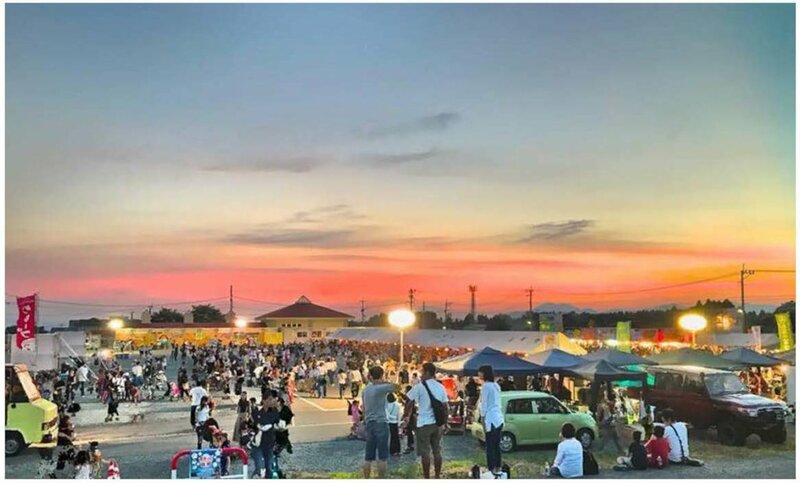 The Festival really became a big event, owing to the participation of Mashiki-machi Township Government which provided their large parking space for this event. It had the exhibits of art works (Pictures 1), a stage for music and dance performances (Picture 2), fire works by projection mapping technology (Picture 3), bon dance (Picture 4), and a food area with three kitchen cars and many food booths (Picture 5). Many shops also had their tents established for selling their goods, and large tents provided space for people to relax. Since it was an extremely hot day, the Master of Ceremony advised people to continuously drink water. Four TV and newspaper companies (KAB Kumamoto Asahi, KKT Kumamoto People TV, Kumamoto Nichi Nichi Newspaper, Yomiura Newspaper) were there reporting the event. 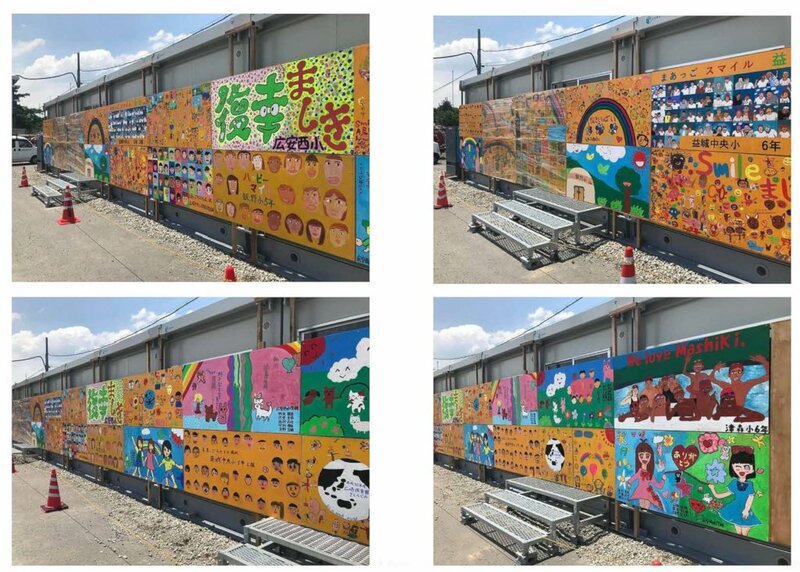 This Festival had three unusual characteristics, since it was (1) redevelopment efforts led by the private sector, (2) by focusing on community redevelopment, and (3) being stimulated by learning from the experiences of Kamaishi City in the East Japan Earthquake and Tsunami Disaster. Kamaishi Kitchen Car team closely cooperated with Mashiki-machi people, while Kamaishi City agreed to provide help to Kumamoto Prefectural Government. The cooperation was enriched by both private and public linkages. The Kamaishi experiences showed how important it is to revive community activities and redevelop local industries. Revival Mashiki, the key organization working for the redevelopment of Mashiki-machi thought of reviving the Summer Festival to ignite a sense of community among Mashiki people. This organization was led by young entrepreneurs, one in the 40s who conducts a horticulture business and the other one whose newly established restaurant was destroyed completely a few days before its opening ceremony by the earthquake. With the funding of DSIA in cooperation with GlobalGiving, they started organizing events as “Wai Wai Hiroba (Chatting Square)” several times. 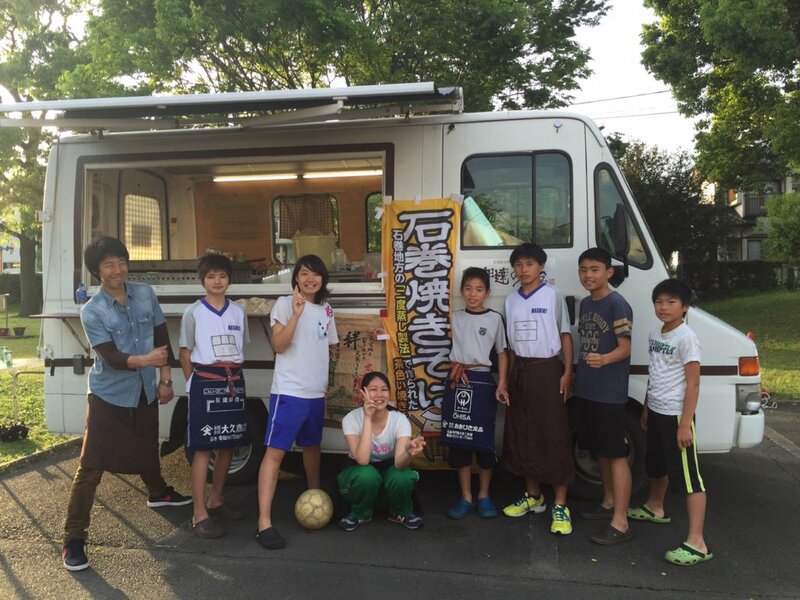 They were also invited by Kamaishi Kitchen Car team to witness the severity of devastation in the East Japan Disaster and experience how Kitchen Car Project and Kamaishi Summer Festival contributed to nurture a sense of community. This learning encouraged the entrepreneurs to revive Mashiki Summer Festival as an attempt to rebuild the community. This movement and also a visit to Kamaishi were all funded by DSIA and GlobalGiving. Everything started from a very small development of “Wai Wai Square” jointly with Kamaishi Kitchen Car team. A sense of trust and cooperation came to be nurtured through organizing several “Wai Wai Squares” together. Through such interaction, they learned the importance of summer festival for community development. However, when they started talking to community members and companies, requesting for support, many people were skeptical about what kind of event it was going to be and how effective it will be for community development. But amazingly, owing to organizers’ efforts, the movement started rolling forward to obtain many participants and donors to make the event unbelievably big. Several attempts were made to develop this even by the organizers. They tried to get as many volunteers as possible and had about 60 participants from a local high school baseball club (36), a university (11), and NGOs and other organizations (13). 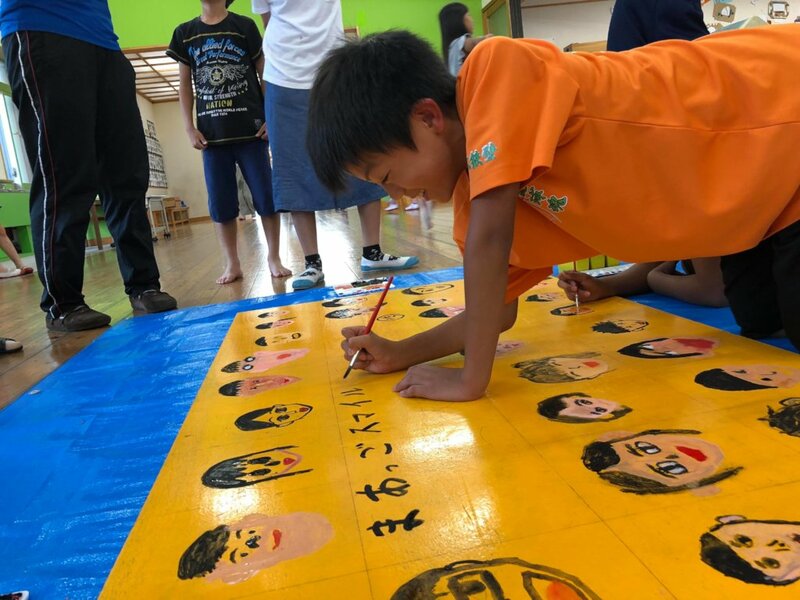 All children from five Mashiki-machi Township grade schools participated to provide art exhibits and developed feeling that it is their own festival. There are local bon dances and songs, the community inherited from their ancestors. However, the earthquake stopped the practice of enjoying the traditional performances. The local Women Association agreed to teach people on dancing, and after three years of stoppage, dance was revived. On the Festival day, ladies in Women’s Association taught children of their grandchildren’s age, resulting in an unusual and fascinating experiences of inter-generational interaction for both senior ladies and children. Junior and senior high school students danced on the stage, while professional artists performed to show their supports to Mashiki-machi. Loud welcoming voice of audience could be heard around the community. Originally, it was planned to soot actual fireworks. But due to fire safety regulations, it was changed to use projection mapping technique over the Mashiki-machi Township building. And names of prominent people in the town were also projected to attract audience. It was one of the most attractive Festival events. The township building is located in an area with no public transportation access. Expecting that many people will come by car, parking space for 395 cars was arranged in three locations. And microbuses were also arranged to carry people from parking spaces to the event place. Some children came on bicycle, spending even half an hour to reach the even place. This year even before the Summer Festival, several natural disasters, including disastrously heavy rain in the West Japan, occurred. A corner was established to write a message and signature on a hand-held fan to share hope and will to overcome difficulties. Many town people signed, and the head of this event organizer will deliver them to Osaka. 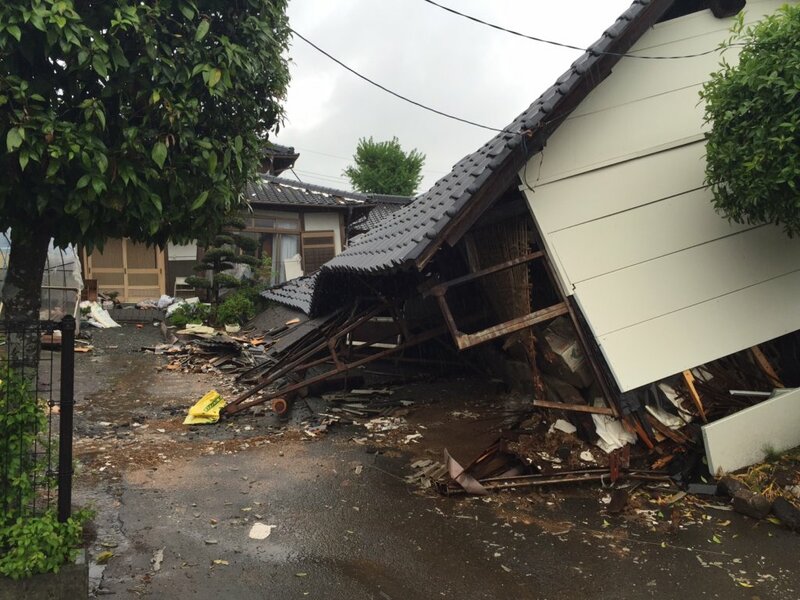 The Kumamoto Earthquake took place only one month after the Kamaishi Kitchen Car Team (KKCT) established the National Kitchen Car Disaster Network in March 2016. 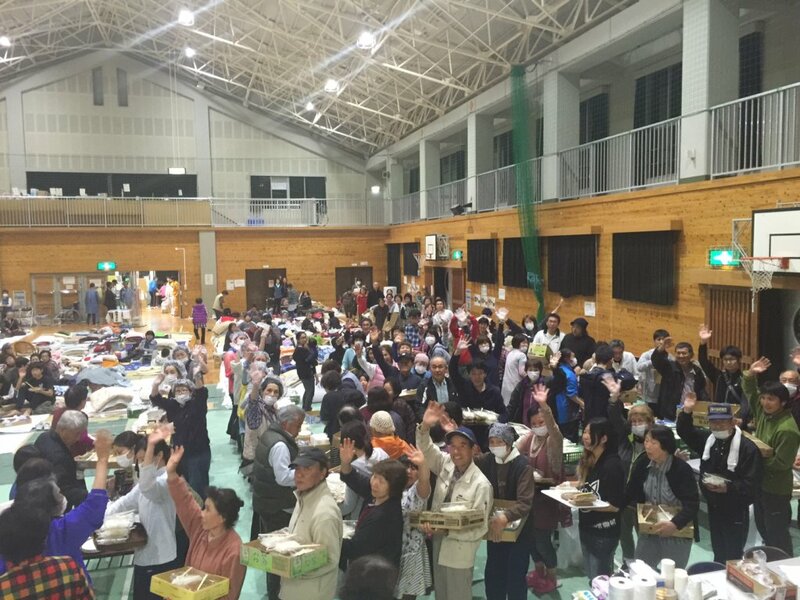 In cooperation with the Kumamoto Catering Car Association, KKCT rushed to disaster-stricken Mashiki Township to serve 20,000 food, especially in remote areas and Children’s LEC Center where psychologically-handicapped children live for treatment. They not only served food, but also promoted the use of kitchen cars for rebuilding restaurant business there. Ten disaster-stricken restaurant owners attended KKCT’s seminars, for which KKCT brought two kitchen cars from Kamaishi and donated them to entrepreneurs wishing to start new businesses. KKCT helped especially one young entrepreneurs whose newly established restaurant was destroyed completely one day before its opening ceremony. Providing valuable information and advises on kitchen car operations, several people started their kitchen-car businesses. Those who are actively involved in rebuilding their economic activities came to establish a voluntary organization, called “Revival Mashiki”. The Project Committee consists of about ten young volunteers (age between 30 and 40). Responding to their initiatives, so far eleven companies, seven NGOs, Mashiki Chamber of Commerce, Mashiki Township Government, and Mashiki Education Committee, all agreed to provide funding and help this event. In other words, the Project Committee very much succeeded to mobilize the whole township and obtained external help to have the big Summer Festival. Amazingly a collaboration between KKCT and DSIA funded by the GlobalGiving was the very source of igniting such movements. It will be really a big boost for redeveloping Mashiki Community, without which the recovery and redevelopment out of the disaster will not take place as quickly as we all hope. “Mashiki Yataimura”, a temporary shop arcade in Mashikicho was established in June 2016, two months after the Kumamoto Earthquake. There, many heart-warming human stories were born. Through interactions among local people and outside supporters, they had opportunities to relieve themselves from pain, sorrow, and bewilderment about their lost family members, today’s living, and future one. But interactions among villagers nurtured community bonds and created new energy and a sense of solidarity as a community for redevelopment. Through the disaster, amid enormous destruction, they found new space for creation, deepened bonds among people, and new movements for redevelopment. Heart-warming stories occurred in Yataimura became a movie, titled “Walking Together, Salon Yataimura” (see the web address) which was just released by Tokyo Cable Network this April. Many Kumamoto Kitchen Car members provided stories and were even in the film. It clearly sent a message that destruction follows creation when new bonds and human interaction take place. As shown in this movie, community movements with deep human bonds, such as those found in Revival Mashiki organized by the Kamaishi Kitchen Car members, are vital for persevering through a disaster and redeveloping a community. They are one of key engines of redeveloping the Mashiki Community in Kumamoto Prefecture, and are pleased to have their contributions recognized in a movie. To sustain their bonds, Revival Mashiki continuously organize diverse events. The most recent one was organized on February 11 (Picture 1), amid very cold temperature of three degree centigrade. Revival Mashiki dared to choose this cold day to show that they are seriously engaging in community building, since such events during winter are not frequently organized. They distributed 600 fliers and spread the event information through SNS. Owing to the cooperation of Self-Governing Organizations in the Mashikicho Techno Temporary Housing Area, quite many people from the old generation came to attend (Picture 2). Although the attendance of 183 people was a little bit less than expected, they came to know that many old people and young children had been waiting for this event (Picture 3 & Picture 4). There was also a live stage of two very popular musicians, which was kept secret fearing that the place may be uncontrollably jam packed (Picture 5). Flags used in the previous event and placed in conspicuous places also helped to bring many new visitors to this event. Ladies in the Self-Governing Organizations demonstrated how to make “Noppe Soup” in front of visitors (Picture 6). For the first time, Self-Governing Organizations participated, suggesting that they themselves came to recognize the importance of such events for building bonds in communities. The outcome clearly shows that efforts of Revival Mashiki are generating significant impacts to the community and are contributing to nurturing deeper bonds and community identity. Movie "Walking Together, Salon Yataimura"
One year and eight months have passed since the Kumamoto Earthquake. But redevelopment in Mashiki-town is still at the stage of repairing infrastructures. Since many damaged roads are still in the process of repairs, the rebuilding of residential houses needs to wait for one or two years. Consequently, people are moving out to Kumamoto City located about half-an-hour drive. Population in Mashiki-town is declining. Besides, at present only a few roads from Mashiki-cho to Kumamoto City are available. The aggravated traffic jam in the morning is becoming not only a serious concern for commuters to the city, but also another reason for moving out of the community. Disaster-stricken shop-owners established a volunteer organization, called “Revival Mashiki (RM)” represented by a young entrepreneur in Yasunage Area in Mashiki-town. The area has an active fault line below their residences. People there, especially children, still suffer from the trauma of earthquake and have lost their smiles. The goals of RM are to bring back smiles to children’s faces and prevent the disintegration of the community by preventing disaster-stricken people from leaving the community. In Fall 2016, six months after the disaster, RM borrowed a small piece of private land, cleared debris, and organized the first “Mashiki Yasunaga Wai Wai Square (MYWW Square),” a starting point of organizing community activities. They had such events four times in 2016 in cooperation with Kamaishi Kichen Car members. On December 17, 2017, they organized a Christmas event in MYWW Square from 11:00 to 16:00 (Picture 1: Waiting for Opening of the Event). Many people of diverse generations from Mashiki-town participated to the event as volunteers. They are children from the town, disaster-stricken shop owners, people from neighborhood temporary shops, township officials, wives of fire station workers. The total number of participants is estimated to be about 220. Some children were busy preparing for shops and some calling for donations to repair a local shrine (Pictures 2 and 3). The Head of the local community proposed to have children experience mochi-pounding, one of typical year-end activities in Japan, and rented his mochi-pounding stone. The mochi-pounding became the opening event at 11:00. The Head was actively cooperating with MR, even to solicit the participation of town people. But it is also true that after four past MR events, people came to recognize its activities. As a Christmas event, established was a Marche where local vegetables and food were sold. Several participants came from all over Kyushu, performing dances, playing music, and singing Christmas Carroll. Two groups of 30 children, one elementary school children and the other pre-school children from the community, performed dances, attracting attentions of many participants, especially parents and community residents watching them dance with heart-filling smiles on their faces. Children who participated to dancing with Christmas costumes were also given special sweet treats. Three amateur bands played as volunteers, and four group belonging to Christian Churches Association performed Christmas Carroll and Gospels. In Mashiki-cho, there has never been any community-based event, such as mochi pounding or bon dance festival. MR also produced fliers, created banners, and sent announcements through SNS. They even made two public announcements of this event through the public emergency radio system, which enabled to reach many senior people. This type of announcement is extremely unusual. It is simply because, for the first time, people came to recognize the importance of building community activities, and the earning of this event will be donated to rebuilding the local shrine. Naturally, local newspaper was reporting this event by interviewing participants. Many people attending the Christmas Event came to enjoy, especially the first two hours. 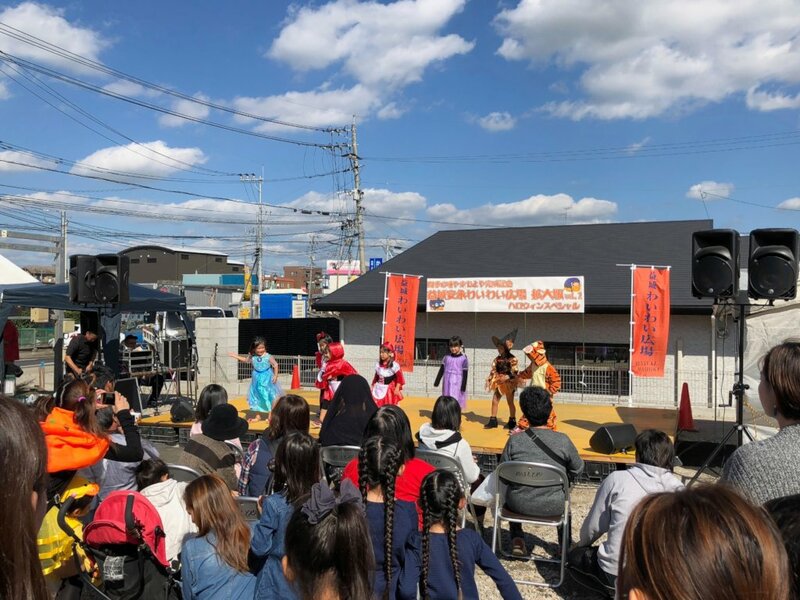 For the first time, all shops were organized by local people without any Kamaishi Kitchen Car team, while the representative from the team participated as advisors to many aspects of organizing such a big event. One suggestion made by the Kamaishi Kitchen Car team was to create banners, so that the festival location can be easily identified. Most of cars going by the Festival slowed down, wondering what kind of events were taking place. The more information people have, the more people come to attend. However, the location where the Festival was held was not big enough to accommodate a large size of people. There is no alternative space. Besides, the two-lane road which this location faces is now planned to be expanded into a four-lane road, which makes it dangerous to organize an event due to a large number of cars on the road. This is a serious problem, since RM plans to expand activities by involving a larger number of community people and participants. Shops along the road will not be able to rebuild until the four-lane road is completed, delaying the process of shop redevelopment to a much later time. The idea of RM is very nice, while the reality is much tougher than what they originally thought. The Kamaishi Kitchen Car team this time committed simply to advise young entrepreneurs of RM, since it is about time for them to carry their own ideas forward by themselves. Providing free food and support is not difficult, but the real difficulty is when to shift responsibilities to the local and to charge money to people instead of free food. This transition is not easy, requiring the right understanding of people’s willingness to contribute to community activities, entrepreneurs’ motivations to take initiatives, and watching other young entrepreneurs’ movements who have not joined RM. The key of the present movements is whether young local entrepreneurs think about their own community, take initiative, and lead the movement. In a disaster-stricken area, community leaders, in many cases, come from formerly non-active members. People from RM should lead such movement, though supports from Kamaishi Kitchen Car team and Mashiki-Kamaishi cooperation undeniably remains as supporting elements. One male in Picture 4 was to have his shop opened on the very day the earthquake took place, and the newly built shop was destroyed completely. Now, he is operating a kitchen car, whose idea was given by the Kamaishi Kitchen Car team. He was actively participating in organizing the event, dreaming of a day when he can establish his own shop. In Kumamoto, there is a word pronounced, “Dekusshiko.” It means that you do things you can or you do start things from what you can do. It seems that everybody is actively participating by doing what they think they can do for the development of the local community, despite many problems they personally have. The next event is scheduled to be help on February 11 (Sun. ), 2018, at MYWW Square.